This image is of a Placophyllia dianthus coral fossil. 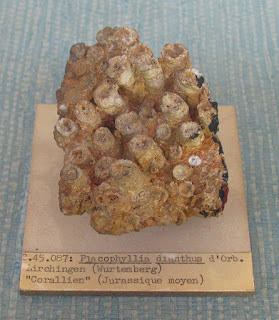 It was found in Lirchingen Wurtemberg Germany. The fossil dates to the Middle Jurassic Period. It was displayed at Muséum National D'Historie Naturelle Jardin Des Plantes Paléontologie et Anatomie Comparée, Paris, France. Image taken 2009.